After a rough fiscal year, game publisher Marvelous Entertainment has announced that it's moving away from original games and sticking with sequels instead. Marvelous Entertainment is dramatically changing the way it operates after a particularly ugly fiscal year. According to a NeoGAF post, the company is selling off its European division, and will stop distributing its own games overseas. Though no official announcement has been made, it seems likely that Marvelous will license its titles to other publishers for international releases. Worst of all, Marvelous is moving away from original games and will only be focusing on sequels. Over the past few years, Marvelous has been involved with several original games that died ugly deaths when they hit the market. Titles like No More Heroes, Little King's Story, and Deadly Premonition were unable to sell as well as the publisher hoped. 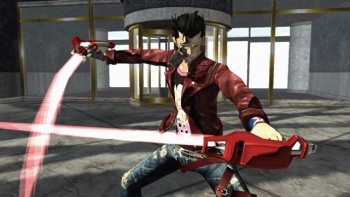 No More Heroes had a particularly disappointing performance in Japan, though it performed a little better in North America and Europe. Little King's Story received critical acclaim, but the game's sales were lukewarm at best. As a result, Cing, the game's developer recently went bankrupt. According to the NeoGaf post: "MMV producer Wada says that they don't want to die like CING did. So they're going to cease developing/funding any new IPs in the foreseeable future." Marvelous Entertainment has a solid number of popular IPs in its game catalogue, such as Harvest Moon and Valhalla Knights; putting out sequels to these established franchises seems like a safe way to operate until the company's finances are once again stable. The company has also expressed an interest in working on projects for the 3DS when it arrives next year, as well as working on some "online browser games." It sounds like the company is in trauma mode, doing its best to try and stay afloat. Hopefully, Marvelous Entertainment will be able to get back into the business of original games in the future, but it sounds like this new publishing plan will be a permanent operating procedure for the foreseeable future. Source: Gamememo via NeoGAF via EuroGamer.